Why does your grants program exist, and what do you aim to achieve by it? This is the first thing you need to establish. This early stage is the time to consider high-level questions about your grants program. What are the key goals and purpose of this grants program? What is the dollar value of the grants program, and over what time period? Are the goals of the grants program consistent with the overall vision and mission of the organisation? Are there secondary goals to be achieved alongside the grants program goals - e.g. equity of access/outcomes for women and girls, improved governance, capacity building? 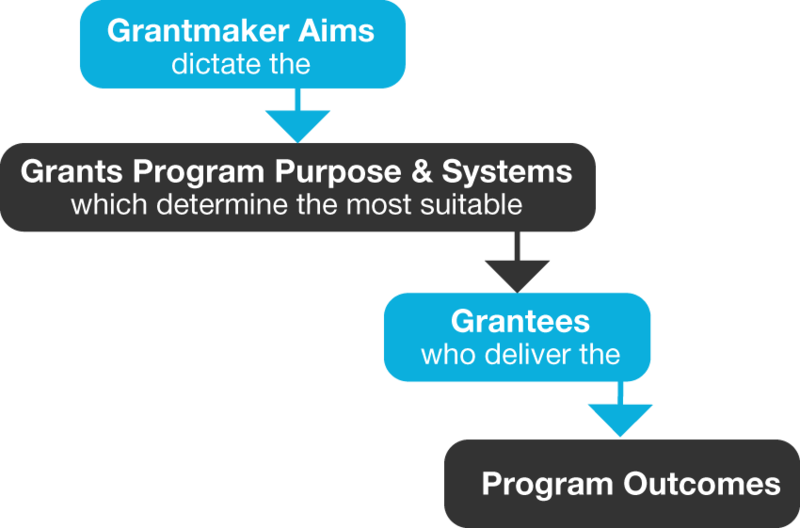 Who are the stakeholders of the grants program? Who will be involved in designing or delivering it, and who will be affected by it? Are the desired outcomes measurable? What are some of the key things that can be measured? Is the grants program a project within a bigger program - if so, what is the total program aiming to achieve? You should be able to draw a clear line from your grantmaking organisation, through the purpose and goals of the grants program, to the outcomes on the ground. It's a good idea to write down the overarching goals of your organisation (or division or department) when you're designing your grants program, along with information about how your grants program connects with those goals. Organisational goals change over time, and in a few years people may well scratch their heads and wonder why the program was ever designed the way it was. Review the goals of your grants program every time you review your program (at least annually), and every time there is a major change in the organisation, such as a change of government or a major policy review.